Jane Coyne is a strategic leader with experience in multiple domains, from supply chain management in the tech sector to hospital management in the Congo. After business school at Kellogg, she spent 10 years in the SF Bay Area working for and consulting to companies on supply chain optimization, from inventory management to network design. In 2003, she left the corporate world behind to begin a decade-plus engagement with MSF/ Doctors Without Borders. Jane’s 6 years of MSF field-work culminated in a program manager role based in Paris, responsible for MSF’s activities in Sudan, South Sudan, Central African Republic, Kenya, and Georgia. 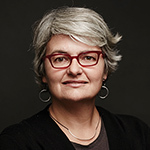 In addition, she has just completed a 3 year term on the board of directors of MSF – USA. Jane recently returned to the SF Bay Area in 2013 and worked as Director of Operations for We Care Solar, helping bring solar energy to health centers with no access to electricity in Africa, Haiti, and other critical regions of the world. In the fall of 2015, she began her current role supporting the United Nation’s Special Envoy on Tuberculosis.